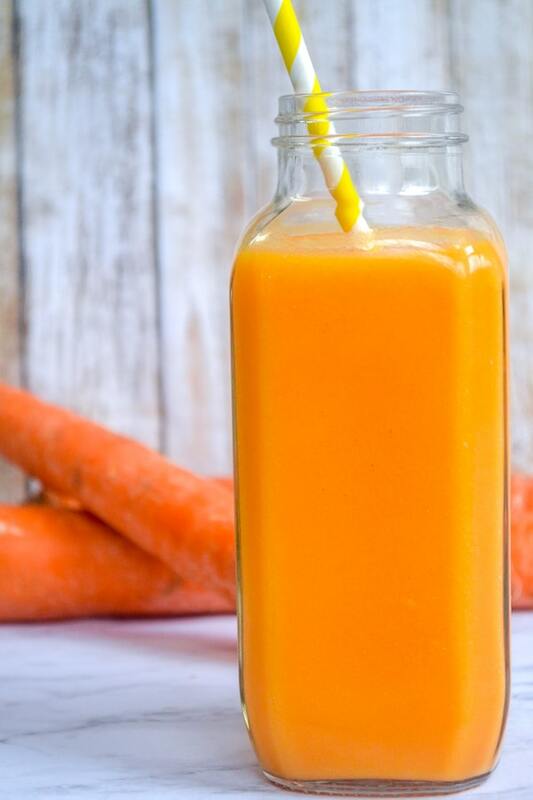 Carrot Orange smoothie is packed with vitamins A and C but it’s really the perfect drink whether you’re sick or not. Kids love how sweet it is and you’ll love it’s packed with immunity-boosting nutrients. Whether you’re looking to help kiddos kick a cold or just want something cool and sweet to sip as an easy snack, this is it. Blend together carrot puree with pineapple and orange juice to make this simple, 3 ingredient smoothie. I have a genius friend. She’s a fellow blogger who has eight amazing kids and homeschooled a bunch of them. Whenever I have a question about kids, I love asking her. She knows the best natural remedies for things and always steers me right. A few months ago Ryan was super sick with a super high fever and just miserable. We later determined he and Owen must have had croup, but the crazy high fever was alarming! My friend saw a few posts on Instagram stories (are you following me?!) and immediately gave me some great advice. One of her recommendations was to pump him with vitamin A! Turns out, vitamin A can benefit your immune system, contains antioxidants, and helps to maintain healthy mucous membranes. Yes, please! A quick Google search showed the vitamin is most prominent in Carrots. So, I sent Alex out to grab one of those bottled smoothies packed with carrots. Packaged smoothies are a “once in a while” treat at our house. But the boys both LOVED this one so I decided I needed to make my own. I decided to make it even more of a cold-busting drink by adding Vitamin C as well! Which brings us to an Orange Carrot smoothie. 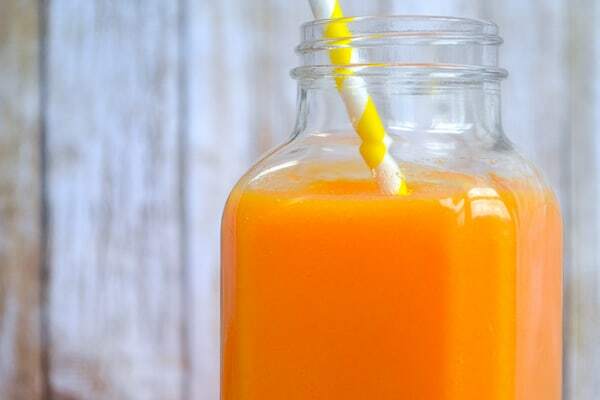 Carrot puree is blended with orange juice and pineapple to make a delightfully fruity drink. Kids love the sweetness, and you’ll love the health benefits! With these super sweet options, your picky eaters won’t notice the veg. 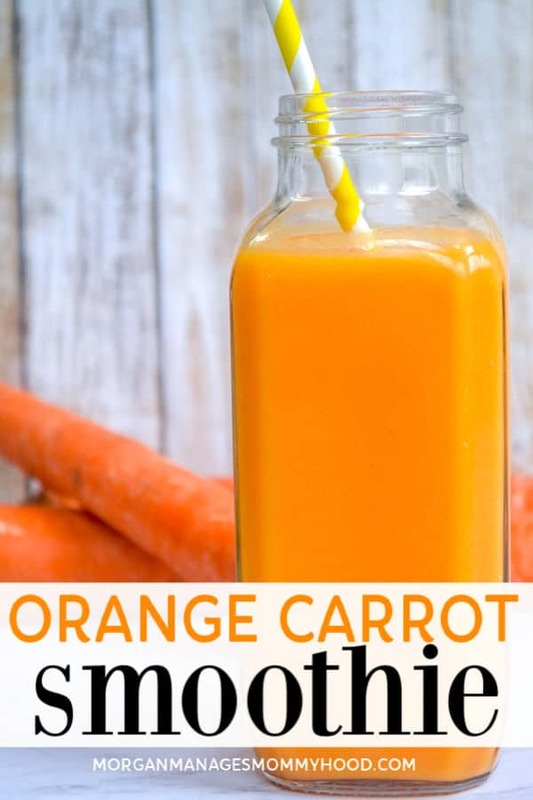 If you need more ideas, check out this post with carrot recipes for kids! Making the actual drink is pretty simple. Like with all of my veggie smoothie recipes, I start with a base of frozen fruit – here I used pineapple. 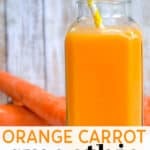 Add in carrot puree and orange juice to make for immunity boosting smoothie your kids will love. In an effort to keep the vibrant orange color, I skipped any dairy making this a dairy free and vegan. You could easily add 1/4 cup of yogurt or sub in some milk of the orange juice if you want a creamier drink. Another option to add creaminess is to add a frozen banana. If you’re making this cold-fighting drink in response to a drippy nose, I highly recommend skipping the dairy. Dairy can thicken mucus, which is no good when you’re already stuffed up. How do you make smoothies taste better? To be honest, I’m not a huge smoothie person, as I admitted in my pina colada smoothie post. Smoothies with dairy do not appeal to me, which is why I tried this one without. Personally, I loved this drink! I was shocked. Here are some ways to improve taste. Go for super sweet fruit. I like mango and pineapple. Purchase a more expensive frozen variety if your budget allows. The quality is better and they’re generally sweeter. Figure out what you DO like. Again, I do not like diary or banana in my smoothie. Some do. Some like it thick, some like it thin. When you figure out what makes a great one for you, you can tweak recipes so that they always taste amazing. Puree your vegetable. If the texture is a problem, try adding puree to your smoothies versus whole veg. This will ensure they essentially melt into the drink so that you can’t feel it there at all. What fruit mixes well with carrots? Carrots are a pretty sweet vegetable, so most every fruit mixes well. My personal favorites are orange, apple, strawberry, pineapple, and mango. 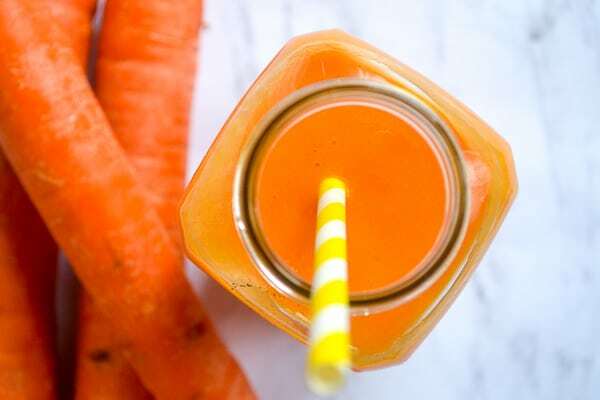 How do you blend carrots? When blending into a smoothie, I recommend using cooked carrots. Fresh or frozen varieties will blend in as well, but it might take a bit longer to get fully incorporated. I create a carrot puree and either add a few scoops or make puree ice cubes from it and blend those in. If you enjoy this recipe, please remember to vote 5 stars! It helps others find this recipe and makes my day. This smoothie is packed with vitamins A and C and is the perfect drink whether you're sick or not. Kids love how sweet it is and you'll love it's packed with immunity-boosting nutrients. Add all ingredients to a blender and blend well until smooth. This recipe doubles and triples very well. If not using carrot puree, one fresh, peeled and chopped carrot would work as well. Just be sure to blend well. Other fruit choices include mango, strawberry, or apple.